Miami Sailfish Fishing On The Reef has been great this summer. With large schools of Little Tunny Tunas migrating past Miami and Miami Beach, we have seen quite a few Sailfish in the mix. This week we have also seen some larger Black Fin Tunas. Also just outside the deep reef. The Sailfish are typically where ever you find the mixed Tunas. 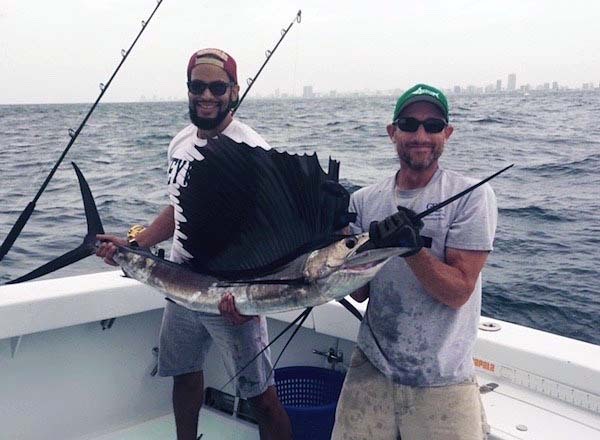 This summer we have been getting a lot of shots at Sailfish. While trolling a combination of Ballyhoo rigged with lures, skirts and feather. As well as fresh Bonita Strips rigged the same way. We also employ bird teasers with double small feathers or lures behind. The combination of teasers, smaller baits and the larger natural baits, do a great job of raising Sailfish. Miami Sailfish fishing tactic of trolling the reef is a fun way to target those amazing fish. Trolling at a speed of 5 to 7 knots we find that the baits swim through the water best. We use wire leaders on the larger natural baits. Wahoo and Kingfish are both around this time of year. The wire gives us a great chance of landing one of those “toothy” fish. You would not like to miss out on a great opportunity. We caught our largest Wahoo of the year on a natural bait while Miami Sailfish Fishing.